Among the involuntary movement disorders, tremor is a common phenomenology seen in clinical practice. It is defined as an involuntary, rhythmic, oscillatory movements of one or more body parts with relatively fixed frequency and amplitude. Tremor is not only confined to a limb, but can involve any body part, including the head, jaw, tongue and soft palate. It is most common among middle-aged and older adults, although it can occur at any age. The disorder generally affects men and women equally. There are many types of tremor with different etiopathogenesis. Broadly, the important causes of tremors include neurodegenerative diseases, stroke, head injury, drugs and toxins, demyelinating disorders, systemic illnesses, metabolic disorders etc., The important factors that need to be determined while assessing a patient with tremor include the phenomenology of tremor, presence or absence of other neurologic signs, and the effect of medications or alcohol. A good history and detailed neurologic examination will usually help in determining the cause of tremor. This review describes the classification, pathophysiology and the various tremor syndromes commonly seen in clinical practice. Tremor can be broadly classified based on the circumstances under which it occurs- either at rest or during an action., This distinction helps in grouping tremors according to their pathophysiology and etiology, which in turn is highly relevant in terms of choosing the appropriate therapeutic options. They can also be classified based on the frequency, body part involved and etiology [Table 1]. Rest tremor is seen in a body part that is relaxed, non-contracting and completely supported against gravity (e.g., when resting an arm on a chair). It is typically enhanced by mental stress (e.g., counting names of the months backward) or while walking. It diminishes or disappears by voluntary movement of the affected body part. In the early period, it is often intermittent and precipitated by stress or anxiety. In most of the rest tremors, the onset is in the upper limbs, often asymmetric. Rest tremors can also be seen in the face and usually involve the lips and jaw. The classical rest tremor is the one seen in Parkinson's disease (PD). Action tremors can be further subdivided into postural, isometric and kinetic tremors. Postural tremors appear when the affected body part is held in a particular position against gravity (e.g, arms parallel to the floor) and kinetic tremors are associated with goal directed voluntary movements of the affected body part. Isometric tremors are associated with sustained muscle contraction against a fixed object. Based on the anatomical distribution, tremors can be classified as head tremors, tongue tremors, jaw tremors, limb tremors, voice tremors, trunk tremors etc. Tremors can be of a low frequency (<4 Hz), medium frequency (4-7 Hz) and high frequency (≥8 Hz). Physiological tremor is usually a high frequency tremor (8-12 Hz) with low amplitude. The frequency of essential tremor (ET) varies between 6-12 Hz while PD tremor usually has frequencies between 4 and 6 Hz. The cerebellar tremor and Holmes tremor are low frequency tremors (less than 5 Hz). 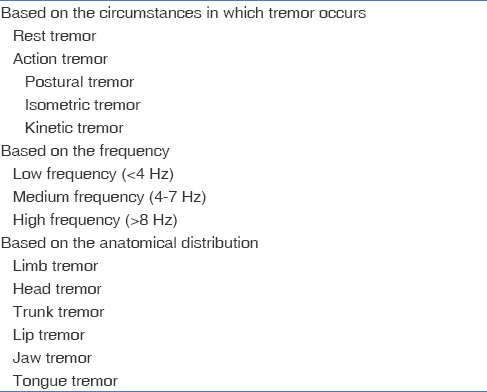 Tremors are also classified based on the underlying etiologies into various tremor syndromes described below. The exact pathophysiology of tremor is still incompletely understood. It was proposed earlier that tremor originates from any of the three sources: mechanical, peripheral and central oscillations. The mechanical oscillations are due to the complex movements occurring at the tendon-muscle-joint system. The peripheral circuit involves the path from muscles to the spinal cord and from the spinal cord to the muscles. On the other hand, the central oscillations involve spinal and suprapinal structures including the basal ganglia, cerebellum and cerebral cortex. However, recently, two basic principles have been postulated in the genesis of tremors. In one hypothesis, there is functional hyperexcitability and rhythmic oscillation of the neuronal loops without any structural changes. Resolution of tremors in some cases with alcohol lends evidence to this functional disturbance hypothesis. Others hypothesize that there is a permanent structural pathology with features of neurodegeneration. Generation of tremor is associated with the dysfunction of two main circuits-the basal ganglia-cerebello-thalamic and the dentate-olivary circuits. The globus pallidus internus (GPi) sends inhibitory projections (GABAergic) to the anterior part of the ventrolateral thalamus (VLa; also known as ventro intermedial nucleus, Vim), and then the projections connect to the motor cortex. Increased activity of the GPi inhibits motor cortical activity. On the other hand, the cerebellar nuclei (dentate in particular) sends glutaminergic excitatory projections to the posterior part of the ventrolateral thalamus (VLp) nucleus and then to the motor cortex. Cerebellar activity causes facilitation of the motor cortical activity. The involvement of this circuit is thought to be associated with tremor generation in patients with PD, ET, dystonic tremor, orthostatic tremor and Holmes tremor. The other circuit (dentato-olivary pathway) involves the red nucleus, inferior olivary nucleus (ION), and the dentate nucleus, forming the triangle of Guillain and Mollaret (Guillain-Mollaret triangle). The dentate nucleus is connected to the contralateral ION by GABAergic inhibitory projections, which in turn send excitatory projections to the Purkinje cells of the cerebellum. The ION receives projections from the red nucleus. ION plays an important role in the genesis of tremors. The neurons within the ION are connected by gap junctions and can thereby act as asynchronized neuronal ensemble., Normally, the ION neurons demonstrate regular oscillatory depolarizations mediated by calcium channels. These oscillations serve as pacemakers in timely processing, temporal coordination and cerebellar motor learning. All these three circuits are interlinked by the subthalamic nucleus (STN), which forms a major junction in the tremor circuit. Lesions in any of these two circuits produce tremor. There are several ways to measure or quantify the tremors. Quantification is important to assess the severity, response to therapy and in clinical studies. The assessment of tremor can be divided into clinical and biomechanical techniques. Clinically, rating scales are used to assess the severity of tremors. The commonly used scales are the “Fahn–Tolosa–Marín tremor rating scale” (FTMTRS) and the “essential tremor rating assessment scale” (TETRAS)., MDS-UPDRS is another scale used to assess the tremors in addition to rigidity, bradykinesia and postural instability in PD patients. The biomechanical analysis of the tremor involves electromyography (EMG), accelerometers, gyroscopes and spirography. Subsequent to data aquisition by EMG and accelerometers, the signal processing and analysis of tremor often involves the spectral analysis, based on Fast Fourier Transformation (FFT). Drawing the Archimedes spiral helps in quantifying action tremors and several digitalized tablets are now available. Essential tremor (ET) is the one of the most common tremor disorders encountered in clinical practice. It is often hereditary and transmitted in an autosomal dominant pattern with high penetrance. The prevalence of ET is estimated to be 4% - 5.6% in people aged 40 years and above. Age, ethnicity and family history of ET have been found to be risk factors. Three genetic loci on chromosome 3q (ETM1), chromosome 2p (ETM2), chromosome 6p (ETM 3) have been identified in some families. However, this has not been reproduced in other studies. There is evidence that environmental factors could serve as modifiers of the underlying susceptibility. Genome wide association studies (GWAS) have found an association with LINGO1 gene and SLC1A2 gene. ET can occur both in children and adults and advancing age has been found to be a risk factor. It usually appears in the second decade, but a second peak is seen in adults older than 35 years. It is a slowly progressive postural tremor and in its classic form involves predominantly both the hands symmetrically. The frequency of ET ranges from 4-12 Hz and varies inversely with the age. 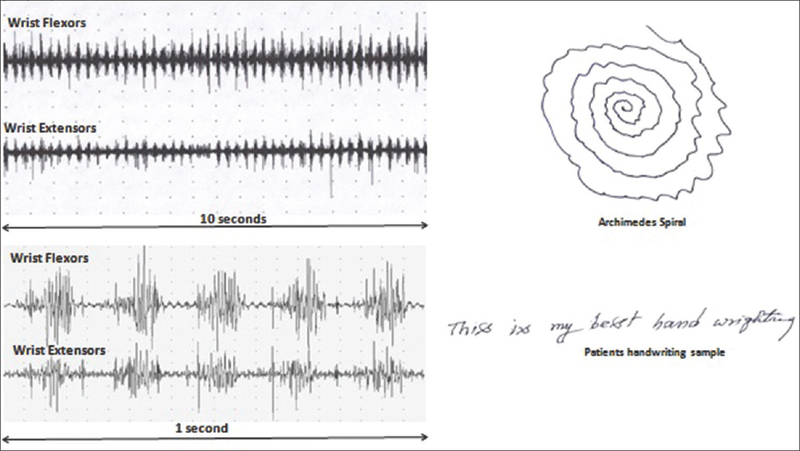 The tremor affects the patient's activities of daily living such as writing, eating, pouring, holding objects etc. However other body parts can also be involved such as head, jaw, voice, tongue, trunk and lower limbs. ET is known to worsen with mental stress, anxiety, activity and subsides or improves with alcohol intake. In almost all of the familial cases of ET, the tremor onset is before the age of 65 years. Sometimes, tremor can be associated with cogwheel rigidity. In the initial stages, the tremor amplitude is low but as the disease progresses, the amplitude increases and can be seen at rest also. ET is a progressive disorder and patients with advanced ET demonstrate intention tremors and impaired tandem gait that are suggestive of cerebellar involvement. At this stage, patients are physically unable to feed or dress themselves, leading to loss of independence. ET is also associated with cognitive impairment and personality disturbances. There is some evidence that a subset of ET patients develop PD and Alzheimer's dementia. Some experts believe that ET is a neurodegenerative disease, in fact, that it starts insidiously and is slowly progressive and is associated with other neurodegenerative diseases. Pathological studies have demonstrated loss of Purkinje cells of the cerebellum, cerebellar cortical sclerosis and proliferation of Bergmann glia., The exact etiology is not known, however electrophysiological studies have shown that ET is caused by a central oscillator. ET disappears with lesions of the thalamus and cerebellum suggesting the location of the central oscillator.,, Some experimental data have suggested olivocerebellar system as the site of central oscillator.,,, Evidence suggests that ET is associated with abnormal functioning of the inhibitory neurotransmitter GABA., Hence, there are three hypotheses that has been proposed to explain the generation of tremors. These include the GABA hypothesis, cerebellar degeneration hypothesis and oscillating network hypothesis. There are many criteria for the diagnosis of ET among which the Tremor Investigation Group criteria (TRIG) and Movement Disorder Society Consensus criteria are the ones most useful. ET should be differentiated from PD tremor and enhanced physiological tremor. Asymmetric onset of tremors with associated features such as rigidity, bradykinesia and postural instability suggests the presence of PD tremor. The frequency of enhanced physiological tremor is usually greater than ET. Electrophysiological studies have shown almost simultaneous bursts of muscle activity in both the agonist and antagonist muscles (co-activation) [Figure 1]. In patients with low frequency tremor, alternating patterns of muscle activity are seen, similar to the ones seen in PD tremor. In ET, the tremor frequency does not reduce on weight loading, whereas in enhanced physiological tremor, the tremor frequency reduces with weight loading of the limb. Surgical treatment in the presence of ET is reserved for those selected patients who have severe tremor not adequately controlled by medical therapy. Contralateral thalamotomy (Vim nucleus) or deep brain stimulation (DBS) of the thalamus are highly effective in reducing the tremor. Bilateral thalamotomy is not recommended due to its adverse side effects. Unilateral thalamotomy contralateral to the most severely affected side is recommended for patients who cannot afford the DBS procedure. Parkinson's disease (PD) is one of the most common neurodegenerative diseases and tremor is one of the cardinal symptoms. The typical PD tremor occurs at rest, is asymmetric in onset, with a frequency of 4 - 6Hz, classically described as the “pill rolling tremor” and seen in distal part of the limbs. The tremor usually manifests in the hand and fingers as with flexion-extension, pronation-supination or oscillatory movements of the hand and forearm. In the leg, the tremors manifest as flexion-extension movement at the ankle. Asymmetric rest tremors seen in the leg are almost always due to PD unless proved otherwise. The tremors markedly increase in amplitude during situations that are stressful or require concentration. In addition to the tremors of the upper or lower limbs, these patients can also have tremors of the lips and lower jaw. The tremor can reappear with almost the same frequency as rest tremor after a delay of 2 or more seconds once the limb has assumed a new posture (action tremor). This is termed as re-emergent tremor. It is an interesting phenomenon as it represents suppression of the tremor on voluntary activity. Re-emergent tremor is not seen in ET. In some PD patients, isolated postural and kinetic tremors are observed. The frequency of these tremors may vary between 5-10 Hz. Postural tremors are more frequent in the akinetic rigid variant of PD. Some authors believe that kinetic (intention) tremor in PD may be a variant of ET or enhanced physiological tremor. In ET, the tremor usually involves the upper limbs, whereas in PD, the tremor can involve both upper and lower limbs. The tremor in PD is asymmetric and associated with rigidity, bradykinesia which is not seen in ET. There is micrographia in PD patients, whereas in ET, there is tremulousness while writing. PD patients sometimes complain of “internal tremors” that are not visible externally. Pathological studies have demonstrated that patients with tremor dominant PD have more neuronal loss in the retrorubral area of the midbrain as compared to those with non-tremor PD. The latter patients have more cell loss in the substantia nigra pars compacta and locus ceruleus., Loss of dopaminergic neurons of the retrorubral area cause dysfunction of the globus pallidus with depletion of dopamine within the striatum. Abnormalities in the serotonergic system have also been observed with reduced serotonin transporters in the thalamus. These neurotransmitter abnormalities have been hypothesized in the generation of tremor. Intraoperative and other electrophysiological studies have shown that the firing patterns of the VLp neurons of the thalamus are highly synchronous with the tremor rather than that of the striatum, supporting the role of the cerebello-thalamo-cortical circuit in the generation of the tremor. However, some authors believe that the tremor is triggered in the GPi and is maintained or amplified in the cerebello-thalamo-cortical circuit (Dimmer switch hypothesis). Electrophysiologically, the duration of EMG bursts is 50-100 msec with an alternating pattern of contraction of the agonist and antagonist muscles, with no effect on the tremor status following weight loading suggesting the presence of a central oscillator [Figure 2]. Orthostatic tremor (OT), also known as “shaky leg syndrome”, is a rare syndrome and was first coined by Heilman. The patients suffering from OTs usually report a feeling of unsteadiness on standing but not while sitting or lying down. OT is characterized by high frequency tremor of the legs (13-18 Hz) that appears on standing and is relieved by sitting, walking or leaning against a wall. OT can be idiopathic without any associated features (primary OT) in about 75% of patients; and, about 25% have additional neurological features (OT plus) such as PD, cerebellar degeneration, restless leg syndrome, peripheral neuropathy, head injury and aqueduct stenosis.,, In majority of the patients, the onset of OT occurs above the age of 60 years; however, the age range for the occurrence of these tremors is 13-85 years. [53,54] Primary OT affects female patients slightly more frequently than the males ones. Idiopathic OT is a progressive disorder, and with time, the symptoms increase. This fact has been confirmed objectively. In more advanced stages, the patients may demonstrate features of cerebellar involvement in the form of impaired tandem gait. Some patients, in addition, demonstrate tremors of the hands, head and trunk. Primary OTs have been classified into those with and without postural tremors. The association of postural tremors of the hand with OT has been estimated to be between 77.4% and 92.3%., The postural tremor is indistinguishable from ET and has a frequency of 5-10 Hz. Clinical examination reveals a rapid tremor of the legs on standing. These tremors are best appreciated by palpation of leg muscles (gastrocnemius or quadriceps) rather than being seen visually. Sometimes, auscultation using a stethoscope of the calf muscles reveals a characteristic sound of distant rotor blades of a helicopter. Surface EMG recordings reveals rhythmic activation of lower limb muscles on standing, with frequencies between 13 and 18 Hz. This rhythmic activity disappears when the patient walks or sits. Frequencies less than 13 Hz have also been observed associated with other clinical features that are supportive of OTs and these types of tremors have been termed as slow OTs [Figure 3]. Slow OTs have been associated with familial essential tremor, multiple sclerosis, Graves' disease, PD and parkinsonism. Orthostatic myoclonus is one of the important differential diagnoses. It is characterized by unsteadiness and jerky movements of the leg muscles on assuming an upright posture. EMG shows short duration bursts that are nonrhythmic and irregular. There is evidence to suggest that there is a central oscillator that includes the cerebellum-brainstem-thalamic pathways in the generation of OT.,, Unilateral transcranial magnetic stimulation of the leg area also resets OTs in both the legs suggesting the presence of a supraspinal oscillator. The tremor frequency shows a strong coherence between the muscles of leg and arm pointing to a central oscillator. OT has also been considered as a progressive neurodegenerative condition as some patients who initially presented with isolated OT subsequently develop PD., As it is a rare disorder, there is inadequate data on the pharamacotherapy. Alcohol and propranolol do not have any effect in OT. Clonazepam is the first line medication that can be started at 0.5mg in the night and gradually increased up to 2mg three times per day. The other second line drugs that can be used are gabapentin, primidone, valproic acid and carbamazepine.,, Bilateral Vim thalamic nucleus stimulation has been shown to improve the symptoms in some patients with medication-resistant OT., Deep brain stimulation of the Vim nucleus has been found to be safe and well tolerated, yielding sustained benefit in selected patients with medically refractory orthostatic tremor. The association between tremor and dystonia is known for more than 100 years. It has been observed that primary dystonias can present with pure action tremors. In some conditions, the dystonia is very mild and the abnormal posturing is often overlooked as a compensatory phenomenon., Dystonic tremor (DT) can occur at rest, in sustained postures, as well as during voluntary movements, and can also be focal and task specific., Focal and segmental dystonias are often associated with tremors that appear like ETs. Using a multichannel EMG, it was shown that patients with dystonia had phasic muscle contractions. These long duration bursts of muscle activity occur at a frequency of 1.0-6.5 Hz and are irregular [Figure 4]. However, sometimes the DT can be rhythmic and can be mistaken for ET. The Consensus Statement of the Movement Disorder Society (MDS) on Tremor has recognized two types of tremor in patients with dystonia: (1) dystonic tremor (tremor in a dystonic body part); and, (2)tremor associated with dystonia (tremor in a body part with no dystonia, but the patient has dystonia elsewhere). There is no clear pathophysiological difference between these two types of tremors. DT is often suppressed by sensory tricks (geste antagoniste) and may exhibit null points (body positions with no tremor), irregular jerky rhythm and amplitude, task or position specificity, persistence at rest, and overflow to neighboring body segments. Medical management includes the use of clonazepam, baclofen, and anticholinergics (trihexyphenidyl). Botulinum toxin injections usually ameliorate dystonia and dystonic tremor, and are accepted as the treatment of choice in medically refractory cases. Vim DBS may be beneficial in medically refractory cases with transient and modest benefit. Holmes tremor (HT) was first described by Gordon Holmes in 1904. It is also known as midbrain (mesencephalic), rubral or cerebellar outflow tremor. However, these terms are no longer used as experimental lesions in these areas have failed to induce persistent tremors.,, These tremors occur at rest and also have an intention component. 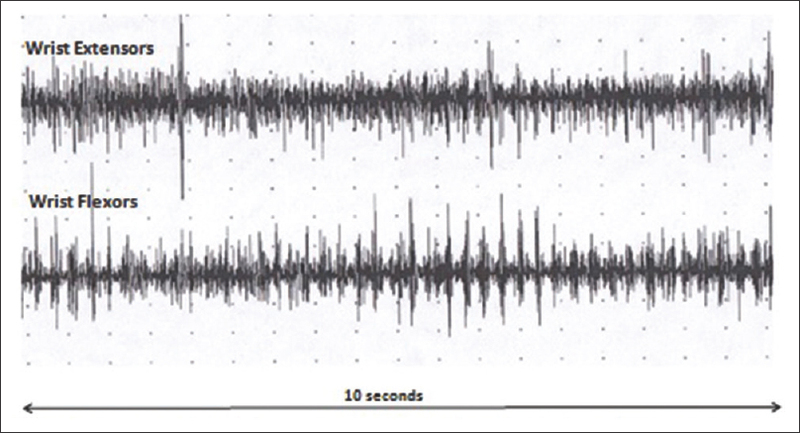 The tremor frequency is usually 3-4 Hz and often these tremors are not rhythmic. HT usually results due to the disruption of the dentato-rubro-thalamic circuit and also the nigro-striatal circuit and is most often due to stroke, trauma, vascular malformations or tumors. In most of the cases, the imaging is abnormal, but in some cases no lesions can be demonstrated. It has been observed that HT develops between 1 and 24 months after the insult and this delay is thought to be due to neuroplasticity changes. Some researchers believe that a double lesion is required for HT to develop, with lesions involving both the dopaminergic nigrostriatal system and the cerebello-thalamo-cortical or dentato-rubro-olivary pathways. In a study of 29 patients with HT, an MRI brain abnormality was seen in 28 patients. These lesions were mostly vascular in etiology. MRI showed lesions in the thalamus, midbrain or cerebellum in 82.7% of the patients. Drug induced tremor is an important problem encountered in clinical practice. 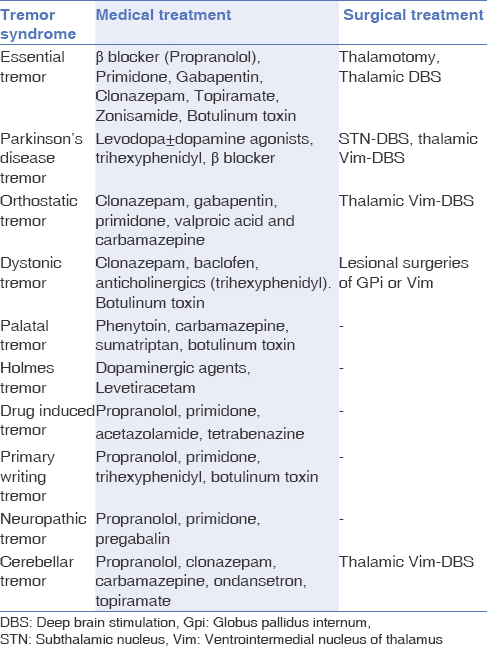 Many drugs have been associated with tremor. Important among them include neuroleptic and dopamine depleting agents (thioridazine, fluphenazine, chlorpromazine, other atypical neuroleptic agents, cinnarizine, flunarizine, tetrabenazine, methyldopa),,, tricyclic antidepressants (amitriptyline, imipramine),, selective serotonin reuptake inhibitors (SSRIs) (fluoxetine), lithium, antiepileptic drugs (valproate, tiagabine, gabapentin, oxcarbazepine, lamotrigine),, bronchodilators (salbutamol, salmeterol),, antiarrhythmic drugs (amiodarone, mexiletine, procainamide),,, antimicrobial agents (co-trimoxazole, vidarabine, acyclovir, amphotericin),,,, chemotherapeutic agents (cytarabine, thalidomide, ifosfamide, tamoxifen),,,,, drugs of abuse (alcohol, nicotine),, gastrointestinal drugs (metoclopramide, cimetidine, misoprostol),,, immunosuppressants/immunomodulators (cyclosporine, tacrolimus),, hormones (levothyroxine, medroxyprogesterone acetate),, methylxanthines (caffeine, aminophylline), etc. There are multiple risk factors associated with drug induced tremor such as old age, underlying medical illness (renal failure, liver failure), polypharmacy with drug interactions, structural brain lesions, and mood disorders. A temporal association with the start of pharmacotherapy and onset of tremor is useful in establishing the diagnosis of drug-induced tremor. Most of the drugs cause postural tremor, although many drugs can also cause resting and intention tremors. In majority of the cases, the tremor disappears after stopping the drug. For drug induced parkinsonism with rest tremors, anticholinergic agents such as trihexyphenidyl can be considered. In case of drug induced postural tremors, propranolol may be tried. Acetazolamide and propranolol are useful in valproate induced tremors, whereas primidone and propranolol are useful in lithium induced tremors., Tetrabenazine may be used for neuroleptic induced tardive tremor. Tremor developing in association with neuropathy is termed as neuropathic tremor. It can be seen in a variety of peripheral neuropathies: Charcot-Marie Tooth (CMT) disease, inflammatory neuropathies such as IgM-monoclonal gammopathy of undetermined significance (IgM-MGUS), chronic inflammatory demyelinating neuropathy (CIDP), multifocal motor neuropathy with conduction block (MMNCB), and recovering Guillian Barre syndrome.,, The characteristic features are that they are postural or action tremors with a frequency of 3-6 Hz and predominantly involve the upper limbs. Nerve conduction studies usually demonstrate demyelinating neuropathy with slowing of conduction velocity. Electrophysiological studies have demonstrated that the tremor frequency in the hand muscles is lower than that seen in the proximal arm muscles, suggesting a peripheral mechanism. The exact mechanism involved in the generation of tremor is not known. Initially, some authors believed that tremor associated with peripheral neuropathy may be due to enhancement of the physiologic tremor by minimal weakness. Subsequently, it was proposed that there is an altered proprioceptive feedback due to the neuropathy with abnormal central processing. Recently studies have shown the role of central oscillators in the thalamo-cortical networks as the generators of tremors. In most of the patients, the tremors are mild; in some patients, however, they can be severe enough to require surgery. Medical management of symptomatic patients is with propranolol, primidone or pregabalin., Vim DBS has also been shown to be effective in reducing the tremor. These are irregular, often of a high amplitude, postural and action tremors. Rest tremors are not seen. They are predominantly intention tremors and have a tremor frequency of less than 5 Hz (3-5 Hz). Tremors can be seen in the head, trunk and extremities. The tremor frequencies also vary with the part of the body being affected. The tremor frequency in the upper extremities ranges from 3-8 Hz, and in the lower extremities it ranges from 1-3 Hz; and, the frequency is 2 - 4 Hz for the truncal tremors. Involvement of the deep cerebellar nuclei, cerebellar outflow tracts and the cerebro-cerebellar loops has been postulated in the tremor production., The common causes of cerebellar tremor include posterior circulation stroke, degenerative diseases (spinocerebellar ataxias, ataxia telengectasia, Friedreich's ataxia etc. ), Wilson's disease, multiple sclerosis, drugs (antiepileptic agents, alcohol), posterior fossa tumors and infective or post infective cerebellar diseases. EMG reveals a long duration burst of muscle activity in an alternating pattern. Management includes treatment of the underlying cause. Propranolol, clonazepam, carbamazepine, and topiramate have been found to be effective. However there is no established therapy till date. Tremor is the commonest manifestation of psychogenic movement disorders and affects up to 55% of the patients., Women are more frequently affected., Tremor can affect any part of the body but is commonly observed in the hands and legs. The characteristic features that help in distinguishing them from organic tremors include their abrupt onset, changing combinations of rest and postural tremors, presence of distractability, suggestibility and entrainability, multiple associated somatisations and spontaneous remissions.,, Electrophysiological studies are helpful in making the diagnosis [Figure 6]. Psychogenic palatal tremor has also been described in the literature. The underlying mechanism is largely unknown; two possible mechanisms have been suggested: coherent oscillations between both the affected limbs, and independent oscillators, suggestive of a clonus mechanism. Another clinical feature described is the coactivation sign that is elicited by passively moving the affected limb and assessing the co-contraction of the antagonist muscle. 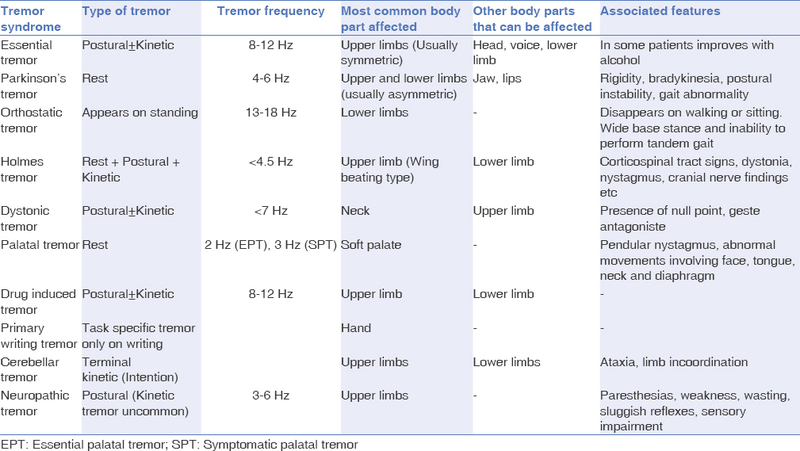 The characteristics and therapeutic options of the different tremor syndromes is summarized in [Table 3] and [Table 4]. Tremors are the most common phenomenology seen in movement disorders clinic. A comprehensive knowledge of the various tremor syndromes helps in guiding appropriate management. 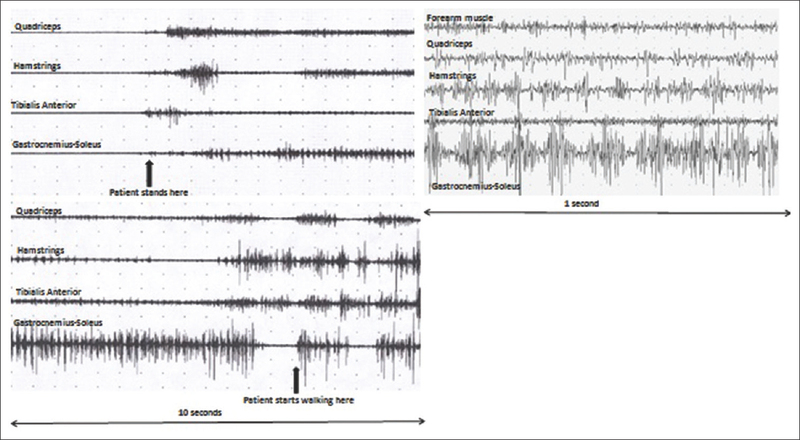 Electrophysiological methods are valuable in the characterization of tremors. In addition to the pharmacological therapy including botulinum toxin therapy, surgical therapies in form of DBS or lesional surgeries are beneficial in reducing the symptoms. Bhidayasiri R. Differential diagnosis of common tremor syndromes. Postgrad Med J 2005;81:756-62. Deuschl G, Bain P, Brin M and an adhoc scientific committee. Consensus statement of the Movement Disorders Society on tremor. Mov Disord 1998;13(suppl 3):2-23. Puschmann A, Wszolek Z. Diagnosis and treatment of common forms of tremor. Semin Neurol 2011;31:65-77. Hess CW, Pullman SL. Tremor: Clinical phenomenology and assessment techniques. Tremor and Other Hyperkinetic Movements. 2012;1-15. Hallett, M. Overview of human tremor physiology. Mov Disord 1998;13:43-48. Helmich RC, Toni I, Deuschl G, Bloem BR. The pathophysiology of essential tremor and Parkinson's tremor. Curr Neurol Neurosci Res 2013;13:378. Anderson ME, Turner RS. Activity of neurons in cerebellar receiving and pallidal-receiving areas of the thalamus of the behaving monkey. J Neurophysiol 1991;66:879-93. Van Der Giessen RS, Koekkoek SK, van Dorp S, De Gruijl, Cupido A, Khosrovani S, et al. Role of olivary electrical coupling in cerebellar motor learning. Neuron 2008;58:599-612. Llinás R, Yarom Y. Oscillatory properties of guinea-pig-inferior olivary neurones and their pharmacological modulation: An in vitro study. J Physiol 1986;376:163-82. Bostan AC, Dum RP, Strick PL. The basal ganglia communicate with the cerebellum. Proc Natl Acad Sci 2010;107:8452-6. Fahn S, Tolosa E, Maris C. Clinical rating scale for tremor. In: Jancovic J, Tolosa E, editors. Parkinson's disease and movement disorders. 2nd ed. Baltimore, MD: Williams and Wilkins; 1993:225-34. Elbe R, Comella C, Fahn S, Hallet M, Jankovic J, Juncos JL et al. Reliability of a new scale for essential tremor. Mov Disord 2012;27:1567-9. Louis ED, Wendt KJ, Pullman SL. Is essential tremor symmetric? Observational data from a community based study of essential tremor. Arch Neurol 1998;55:1553-59. Louis ED, Fernandez-Alvarez E, Dure LS, Fruct S, Ford B. Association between male gender and pediatric essential tremor. Mov Disord 2005;20:904-6. Jimenez-Jimenez FJ, Alonso-Navarro H, Garcia-Martin E, Lorenzo-Betancor O, Pastor P, Agundez JAG. Update on genetics of essential tremor. Acta Neurol Scand 2013; doi: 10.1111/ane.12148. Tanner CM, Goldman SM, Lyons KE, Aston DA, Tetrud JW, Welsh MD, et al. Essential tremor in twins. An assessment of genetic vs environmental determinants of etiology. Neurology 2001;57:1389-91. Elble RJ. Essential tremor frequency decreases with time. Neurology 2000;55:1547-51. Deuschl G, Bergman H. Pathophysiology of nonparkinsonian tremor. Mov Disord 2002;17:S41-S48. Lombardi WJ, Woolston DJ, Roberts WJ, Gross RE. Cognitive deficits in patients with essential tremor. Neurology 2001;57:785-90. Shahed J, Jankovic J. Exploring the relationship between essential tremor and Parkinson's disease. Parkinsonism Relat Disord 2007;13:67-76. Louis ED, Faust PL, Vonsattel JP, Honig LS, Rajput A, Robinson CA, et al. Neuropathological changes in essential tremor: 33 cases compared with 21 controls. Brain 2007;130:3297-307. Shill HA, Alder CH, Sabbagh MN, Connor DJ, Caviness JN, Hentz JG, et al. Pathological findings in prospectively ascertained essential tremor subjects. Neurology 2008;70:1452-5. Duncan R, Bone I, Melville ID. Essential tremor cured by infarction adjacent to the thalamus. J Neurol Neurosurg Psychiatry 1988;51:591-2. Dupuis MJM, Delwaide PJ, Boucquey D, Gonsette RE. Homolateral disappearance of essential tremor after cerebellar stroke. Mov Disord 1989;4:183-7. Nagarathnam N, Kalasabail G. Contralateral abolition of essential tremor following a pontine stroke. J Neurol Sci 1997;149:195-6. Wilms H, Sievers J, Deuschl G. Animal models of tremor. Mov Disord 1999;14:557-71. Colebatch JG, Findley LJ, Frackowiak RSJ, Marsden CD, Brooks DJ. Preliminary report: Activation of the cerebellum in essential tremor. Lancet 1990;336:1028-30. Hallet M, Dubinsky RM. Glucose metabolism in the brain of patients with essential tremor. J Neurol Sci 1993;114:45-8. Louis ED, Vonsattel JPG, Honig LS, Ross GW, Lyons KE, Pahwa R. Neuropathologic findings in essential tremor. Neurology 2006;66:1756-9. Mally J, Baranyi M, Vizi ES. Changes in the concentrations of amino acids in CSF and serum of patients with essential tremor. J Neural Transm 1996;103:555-60. Boecker H, Weindl A, Brooks DJ, Ceballos-Baumann AO, Liedtke C, Miederer M, et al. GABAergic dysfunction in essential tremor: An 11C-flumazenil PET study. J Nucl Med 2010;51:1030-5. Pal PK. Guidelines for management of essential tremor. Ann Ind Acad Neurol 2011;14:25-8. Pahwa R, BusenbarkK, Swanson-Hyland EF, Dubinsky RM, Hubble JP, Gray C. Botulinum toxin treatment of essential head tremor. Neurology 1995;45:822-4. Wissel J, Masuhr F, Schelosky L, Ebersbach G, Poewe W. Quantitative assessment of botulinum toxin treatment in 43 patients with head tremor. Mov Disord 1997;12:722-6. Zirh A, Reich SG, Dougherty PM, Lenz FA. Stereotactic thalamotomy in the treatment of essential tremor of the upper extremity: Reassessment including a blinded measure of outcome. J Neurol Neurosurg Psychiatry 1999;66:772-5. Elble RJ. Tremor: Clinical features, pathophysiology, and treatment. Neurol Clin 2009;27:679-95. Zach H, Dirkx M, Bloem BR, Helmich RC. The clinical evaluation of Parkinson tremor. J Parkinson Dis 2015;471-4. Jankovic J, Schwartz KS, Ondo W. Re-emergent tremor of Parkinson's disease. J Neurol Neurosurg Psychiatr 1999;67:646-50. Deuschl G, Raethjen J, Baron R, Lindemann M, Wilms H, Krack P. The pathophysiology of parkinsonian tremor: A review. J Neurol 2000;247(Suppl 5):V33-48. Jellinger KA. Neuropathology of sporadic Parkinsons disease: Evaluation and changes of concepts. Mov Disord 2012;27:8-30. Hirsch EC, Mouatt A, Faucheux B, Bonnet AM, Javoy-Agid F, Graybiel AM, et al. Dopamine, tremor and Parkinsons diasease. Lancet 1992;340:125-126. Caretti V, Stoffers D, Winogrodzka A, Isaias IU, Costantino G, Pezzoli G, et al. Loss of thalamic serotonin transporters in early drug naïve Parkinson's disease patients is associated with tremor: An [123I] β-CIT SPECT study. J Neural Transm 2008;115:721-9. Timmermann L, Gross J, Dirks M, Volkmann J, Freund HJ, Schnitzler A. The cerebral oscillatory network of parkinsonian resting tremor. Brain 2003;126:199-212. Carr J. Tremor in Parkinson's disease. Parkinsonism Relat Disord 2002;8:223-34. Crosby NJ, Deane KH, Clarke CE. Beta-blocker therapy for tremor in Parkinson's disease. Cochrane Database Syst Rev 2003;(1):CD003361. Krack P, Poepping M, Weinert D, Schrader B, Deuschl G. Thalamic, pallidal, or subthalamic surgery for Parkinson's disease? J Neurol 2000;247(Suppl 2):122-34. Deuschl G, Schade-Brittinger C, Krack P, Volkmann J, Schafer H, Botzel K, et al. A randomized trial of deep-brain stimulation for Parkinson's disease. N Engl J Med 2006;355:896-908. Heilman KM. Orthostatic tremor. Arch Neurol1984;41:880-1. Gerschlager W, Brown P. Orthostatic tremor—a review. Hand Clin Neurol 2011;100:457-62. Jones L, Bain PG. Orthostatic tremor. Pract Neurol 2011;11:240-3. Benito-Leoxn J, Domingo-Santos A. Orthostatic tremor: An update on a rare entity. Tremor Other Hyperkinet Mov. 2016;6:1-14. Hassan A, Ahlskog JE, Matsumoto JY, Milber JM, Bower JH, Wilkinson JR. Orthostatic tremor: Clinical, electrophysiologic, and treatment findings in 184 patients. Neurology 2016;86:458-64. Gerschlager W, Munchau A, Katzenschlager R, Brown P, Rothwell JC, Quinn N, et al. Natural history and syndromic associations of orthostatic tremor: A review of 41 patients. Mov Disord 2004;19:788-95. Feil K, Bottcher N, Guri F, Krafczyk S, Schoberl F, Zwergal A, et al. Long-term course of orthostatic tremor in serial posturographic measurement. Parkinsonism Relat Disord 2015;21:905-10. Piboolnurak P, Yu QP, Pullman SL. Clinical and neurophysiologic spectrum of orthostatic tremor: Case series of 26 subjects. Mov Disord 2005;20:1455-61. Brown P. New clinical sign for orthostatic tremor. Lancet 1995;346:306-7. Wills AJ, Thompson PD, Findley LJ, Brooks DJ. A positron emission tomography study of primary orthostatic tremor. Neurology 1996;46:747-52. Setta F, Jacquy J, Hildebrand J, Manto MU. Orthostatic tremor associated with cerebellar ataxia. J Neurol1998;245:299-302. Gallea C, Popa T, Garcia-Lorenzo D, Valabreque R, Legrand AP, Apartis E, et al. Orthostatic tremor: A cerebellar pathology? Brain 2016;139:2182-97. Spiegel J, Fuss G, Krick C, Dillmann U. Impact of different stimulation types on orthostatic tremor. Clin Neurophysiol 2004;115:569-75. Ganos C, Maugest L, Apartis E, Gasca-Salas C, Caceres-Redondo MT, Erro RT, et al. The long-term outcome of orthostatic tremor. J Neurol Neurosurg Psychiatry 2016;87:167-72. McManis PG, Sharbrough FW. Orthostatic tremor: Clinical and electrophysiologic characteristics. Muscle Nerve 1993;16:1254-60. Evidente VG, Adler CH, Caviness JN, Gwinn KA. Effective treatment of orthostatic tremor with gabapentin. Mov Disord 1998;13:829-31. Van der Zwan A, Verwey JC, van Gijn J. Relief of orthostatic tremor by primidone. Neurology 1988;38:1332. Espay AJ, Duker AP, Chen R, Okun MS, Barrett ET, Devoto J, et al. Deep brain stimulation of the ventral intermediate nucleus of the thalamus in medically refractory orthostatic tremor: Preliminary observations. Mov Disord 2008;23:2357-62. Merola A, Fasano A, Hassan A, Ostrem JL, Contarino MF, Lyons M, et al. Thalamic deep brain stimulation for orthostatic tremor: A multicenter international registry. Mov Disord 2017;32:1240-4. Oppenheim, V.H. ÜbereineeigenartigeKrampfkrankheit des kindlichen und jugendlichen Alters (Dysbasialordoticaprogressiva, Dystonia musculorumdeformans). Neurol ChI 1911;30:1090-107. Quinn NP, Schneider SA, Schwingenschuh P, Bhatia KP. Tremor-some controversial aspects. Mov Disord 2011;26:18-23. Lalli S, Albanese A. The diagnostic challenge of primary dystonia: Evidence from misdiagnosis. Mov Disord 2010;25:1619-26. Sheehy MP, Marsden CD. Writers' cramp-a focal dystonia. Brain 1982;105:461-80. Yanagisawa N, Goto A. Dystonia musculorum deformans. Analysis with electromyography. J Neurol Sci 1971;13:39-65. Deuschl G. Dystonic tremor. Rev Neurol (Paris) 2003;159:900-5. Cury RG, Fraix V, Castrioto A, Pérez Fernández MA, Krack P, Chabardes S, et al. Thalamic deep brain stimulation for tremor in Parkinson disease, essential tremor, and dystonia. Neurology 2017;89:1416-23. Deuschl G, Wilms H. Clinical spectrum and physiology of palatal tremor. Mov Disord. 2002;17:S63-6. Deuschl G, Mischke G, Schenck E, Schulte-Monting J, Lucking CH. Symptomatic and essential rhythmic palatal myoclonus. Brain 1990;113:1645-72. Deuschl G, Toro C, Valls-Sole J, Zeffiro T, Zee DS, Hallett M. Symptomatic and essential palatal tremor. Clinical, physiological and MRI analysis. Brain 1994;117:775-88. Nakada T, Kwee IL. Oculopalatal myoclonus. Brain 1986;109:431-41. Nagaoka M, Narabayashi H. Palatal myoclonus—its remote influence. J Neurol Neurosurg Psychiatry 1984;47:921-6. Yanagisawa T, Sugihara H, Shibahara K, Kamo T, Fujisawa K, Murayama M. Natural course of combined limb and palatal tremor caused by cerebellar-brain stem infarction. Mov Disord 1999;14:851-4. Goto N, Kaneko M. Olivary enlargement: Chronological and morphometric analyses. Acta Neuropathol (Berl) 1981;54:275-82. Barron KD, Dentinger MP, Koeppen AH. Fine structure of neurons of the hypertrophied human inferior olive. J Neuropathol Exp Neurol. 1982;41:186-203. Pakiam AS, Lang AE. Essential palatal tremor: Evidence of heterogeneity based on clinical features and response to sumatriptan. Mov Disord 1999;14:179-80. Carman KB, Ozkan S, Yarar C, Yakut A. Essential palatal tremor treated with botulinum toxin. Pediatr Neurol. 2013;48:415-7. Penney SE, Bruce IA, Saeed SR. Botulinum toxin is effective and safe for palatal tremor: A report of five cases and a review of the literature. J Neurol 2006;253:857-60. Holmes G. On certain tremors in organic cerebral lesions. Brain 1904;27:327-75. Remy P, de Recondo A, Defer G, Loc'h C, Amarenco P, Plante-Bordeneuve, et al. Peduncular “rubral” tremor and dopaminergic denervation: A PET study. Neurology 1995;45:472-7. Rieder CR, Reboucas RG, Ferreira MP. Holmes tremor in association with bilateral hypertrophic olivary degeneration and palatal tremor: Chronological considerations: Case report. Arq Neuropsiquiatr 2003;61:473-7. Samie MR, Selhorst JB, Koller WC. Post-traumatic midbrain tremors. Neurology 1990;40:62-6. Deuschl G. Differential diagnosis of tremors. J Neural Transm Suppl 1999;56:211-20. Gajos A, Bogucki A, Schinwelski M, Soltan W, Rudzinska M, Budrewicz S et al. The clinical and neuroimaging studies in Holmes tremor. Acta Neurol Scand 2010;122:360-6. Raina GB, Cersosimo MG, Folgar SS, Giugni JC, Calandra C, Paviolo JP et al. Holmes tremor: Clinical description, lesion localization, and treatment in a series of 29 cases. Neurology. 2016;86:931-8. Ferlazzo E, Morgante F, Rizzo V, Sciarrone G, Meduri M, Magaudda A, et al. Successful treatment of Holmes tremor by levetiracetam. Mov Disord. 2008;23:2101-3. Boelmans K, Gerloff C, Münchau A. Long-lasting effect of levodopa on Holmes' tremor. Mov Disord 2012;27:1097-8. Sethi KD, Zamrini EY. Asymmetry in clinical features of drug induced parkinsonism. J Neuropsychiatry Clin Neurosci 1990;2:64-66. Marti-Masso JF, Poza JJ. Cinnarizine-induced parkinsonism: Ten years later. Mov Disord 1998;13:453-56. Sethi KD. Movement disorders induced by dopamine blocking agents. Semin Neurol 2001;21:59-68. Watanabe S, Yokoyama S, Kubo S, Iwai H, Kuyama C. A double blind controlled study of clinical efficacy of maprotiline and amitriptyline in depression. Folia Psychiatr Neurol Jpn 1978;32:1-31. Kronfol Z, Greden JF, Zis AP. Imipramine-induced tremor: Effects of a beta-adrenergic blocking agent. J Clin Psychiatry 1983;44:225-6. Serrano-Duenas M. Fluoxetine-induced tremor: Clinical features in 21 patients. Parkinsonism Relat Disord 2002;8:325-7. Factor SA. Lithium-induced movement disorders. In: Sethi KD, ed. Drug-induced movement disorders. New York: Marcel Dekker, 2004:209-31. Hyman NM, Dennis PD, Sinclair KG. Tremor due to sodium valproate. Neurology 1979;29:1177-80. Drugs.com Drug Information Online. PDR drug information for Gabitril tablets. Available from: http://www.drugs.com/pdr/tiagabine_hydrochloride.html. [Last accessed on 2005 Nov 02]. Shrewsbury S, Hallett C. Salmeterol 100 μg: An analysis of its tolerability in single and chronic-dose studies. Ann Allergy Asthma Immunol 2001;87:465-73. Nizet TA, Broeders ME, Folgering HT. Tremor side effects of salbutamol, quantified by a laser pointer technique. Respir Med 2004;98:844-50. Charness ME, Morady F, Scheinman MM. Frequent neurologic toxicity associated with amiodarone therapy. Neurology 1984;34:669-71. Rubinstein A, Cabili S. Tremor induced by procainamide. Am J Cardiol1986;57:340-1. Manolis AS, Deering TF, Cameron J, Estes NA 3rd. Mexiletine: Pharmacology and therapeutic use. Clin Cardiol 1990;13:349-59. Borucki MJ, Matzke DS, Pollard RB. Tremor induced by trimethoprim-sulfamethoxazole in patients with acquired immunodeficiency syndrome (AIDS). Ann Intern Med 1988;109:77-8. Burdge DR, Chow AW, Sacks SL. Neurotoxic effects during vidarabine therapy for herpes zoster. Can Med Assoc J 1985;132:392-5. Wade JC, Meyers JD. Neurologic symptoms associated with parenteral acyclovir treatment after marrow transplantation. Ann Intern Med 1983;98:921-5. Mott SH, Packer RJ, Vezina LG, Kapur S, Dinndorf PA, Conry JA, et al. Encephalopathy with parkinsonian features in children following bone marrow transplantations and high-dose amphotericin B. Ann Neurol 1995;37:810-4. Weber D, Rankin K, Gavino M, Delasalle K, Alexanian R. Thalidomide alone or with dexamethasone for previously untreated multiple myeloma. J Clin Oncol 2003;21:16-9. Lafolie P, Lilliemark J, Bjork O, Aman J, Wranne L, Peterson C. Exchange of cerebrospinal fluid in accidental intrathecal overdose of cytarabine. Med Toxicol Adverse Drug Exp 1988;3:248-52. Pratt CB, Horowitz ME, Meyer WH, Etcubanas E, Thompson EI, Doughlass EC, et al. Phase II trial of ifosfamide in children with malignant solid tumors. Cancer Treat Rep 1987;71:131-5. Schilsky RL, Barlock A, Ozols RF. Persistent hypomagnesemia following cisplatin chemotherapy for testicular cancer. Cancer Treat Rep 1982;66:1767-9. Trump DL, Smith DC, Ellis PG, Rogers MP, Schold SC, Winer EP, et al. High-dose oral tamoxifen, a potential multidrug-resistance-reversal agent: Phase I trial in combination with vinblastine. J Natl Cancer Inst 1992;84:1811-6. Neiman J, Lang AE, Fornazzari L, Carlen PL. Movement disorders in alcoholism: A review. Neurology 1990;40:741-6. Shiffman SM, Gritz ER, Maltese J, Lee MA, Schneider NG, Jarvik ME. Effects of cigarette smoking and oral nicotine on hand tremor. Clin Pharmacol Ther 1983;33:800-5. Acharya SR, Kumar TN, Vasshadhara C. Metoclopramide—a cholinomimetic tremorogen? J Assoc Physicians India 1982;30:119. Bateman DN, Bevan P, Longley BP, Mastaglia F, Wandless I. Cimetidine induced postural and action tremor. J Neurol Neurosurg Psychiatry 1981;44:94. Graber DJ, Meier KH. Acute misoprostol toxicity. Ann Emerg Med 1991;20:549-51. Gijtenbeek JM, van den Bent MJ, Vecht CJ. Cyclosporine neurotoxicity: A review. J Neurol 1999;246:339-46. Uemoto S, Tanaka K, Honda K, Tokunaga Y, Sano H, Katoh H et al. Experience with FK506 in living-related liver transplantation. Transplantation 1993;55:288-92. Mandel SH, Magnusson AR, Burton BT, Swanson JR, LaFranchi SH. Massive levothyroxine ingestion. Conservative management. Clin Pediatr (Phila) 1989;28:374-6. Falkson G, Falkson HC. A phase II study of high-dose medroxyprogesterone acetate in advance breast cancer. Cancer Chemother Pharmacol 1983;11:16-8. Buss DC, Marshall RW, Milligan N, McQueen I, Compston DA, Routledge PA. The effect of intravenous aminophylline on essential tremor. Br J Clin Pharmacol 1997;43:119-21. Morgan JC, Sethi KD. Drug induced tremors. Lancet Neurol 2005;4:866-76. Katzenschlager R, Sampaio C, Costa J, Lees A. Anticholinergics for symptomatic management of Parkinson's Disease. Cochrane Database Syst Rev 2003;2:CD003735. Perucca E. Pharmacological and therapeutic properties of valproate. A summary after 35 years of clinical experience. CNS Drugs 2002;16:695-714. Arbaizar B, Gomez-Acebo I, Llorca J. Postural induced-tremor in psychiatry. Psychiatry Clin Neurosci 2008;62:638-45. Fernandez HH, Friedman JH. Classification and treatment of tardive syndromes. Neurologist 2003;9:16-27. Rothwell JC, Traub MM, Marsden CD. Primary writing tremor. J Neurol Neurosurg Psychiatr 1979;42:1106-14. Hai C, Yu-ping W, Hua W, Ying S. Advances in primary writing tremor. Parkinsonism and Related Disord 2010;16:561-5. Bain PG, Findley LJ, Britton TC, Rothwell JC, Gresty MA, Thompson PD, et al. Primary writing tremor. Brain 1995;118:1461-72. Hughes M, McLellan DL. Increased co-activation of the upper limb muscles in writer's cramp. J Neurol Neurosurg Psychiatr 1985;48:782-7. Cohen LG, Hallett M. Hand cramps: Clinical features and electromyographic patterns in a focal dystonia. Neurology 1988;38:1005-12. Nakashima K, Rothwell JC, Day BL, Thompson PD, Shannon K, Marsden CD. Reciprocal inhibition between forearm muscles in patients with writer's cramp and other occupational cramps, symptomatic hemidystonia and hemiparesis due to stroke. Brain 1989;112:681-97. Lederman RJ. Tremor in instrumentalists: Influence of tremor type on performance. Med Probl Perform Art 2007;22:70-3. Lederman RJ. Primary bowing tremor: A task-specific movement disorder of string instrumentalists. Med Probl Perform Art 2012;27:219-23. Papapetropoulos S, Singer C. Treatment of primary writing tremor with botulinum toxin type A injections: Report of a case series. 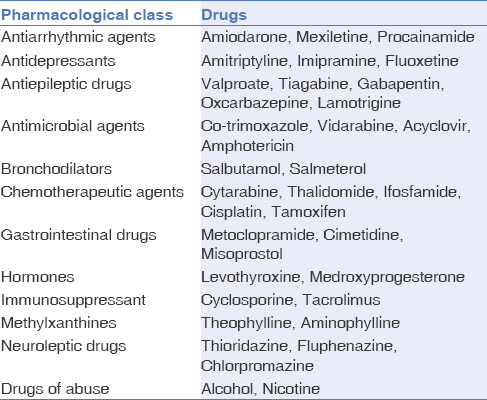 Clin Neuropharmacol 2006;29:364-7. Ahlskog MC, Kumar N, Mauermann ML, Klein CJ. IgM-monoclonal gammopathy neuropathy and tremor: A first epidemiologic case control study. Parkinsonism Relat Disord 2012;18:748-52. Alonso-Navarro H, Ferna'dez-Diaz A, Martı'n-Prieto M, Ruiz-Ezquerro JJ, Lopez-Alburquerque T, Jimenez-Jimenez FJ. Tremor associated with chronic inflammatory demyelinating peripheral neuropathy: Treatment with pregabalin. Clin Neuropharmacol 2008;31:241-4. Saifee TA, Schwingenschuh P, Reilly MM, Lunn MP, Katschnig P, KassavetisP,et al. Tremor in inflammatory neuropathies. J Neurol Neurosurg Psychiatry 2013;84:1282-7. Saperstein DS, Barohn RJ. Neuropathic Tremor. In Lyons KE, Pahwa R, eds. Handbook of essential tremor and other tremor disorders. Boca Raton, FL. Taylor and Francis group. 2005;275-81. Said G, Bathien N, Cesaro P. Peripheral neuropathies and tremors. Neurology 1982;32:480-5. Bain PG, Britton TC, Jenkins IH, Thompson PD, Rothwell JC, Thomas PK, et al. Tremor associated with benign IgM paraproteinaemic neuropathy. Brain 1996;119:789-99. Weiss D, Govindan RB, Rilk A, Watchter T, Breit S, Zizisperger L, et al. Central oscillators in a patient with neuropathic tremor: Evidence from intraoperative local field potential recordings. Mov Disord 2011;26:323-7. Sechi GP, Zuddas M, Piredda M, Agnetti V, Sau G, Piras ML, et al. Treatment of cerebellar tremors with carbamazepine: A controlled trial with long-term follow-up. Neurology 1989;39:1113-5. Factor SA, Podskalny GD, Molho ES. Psychogenic movement disorders: Frequency, clinical profile, and characteristics. J Neurol Neurosurg Psychiatry 1995;59:406-12. Bhatia KP, Schneider SA. Psychogenic tremor and related disorders. J Neurol 2007;254:569-74. Kamble N, Prashantha DK, Jha M, Netravathi M, Reddy YC, Pal PK. Gender and age determinants of psychogenic movement disorders: A clinical profile of 73 patients. Can J Neurol Sci 2016;43:268-77. Peckham EL, Hallett M. Psychogenic movement disorders. Neurol Clin 2009;27:801-19. Deuschl G, Raethjen J, Lindemann M, Krack P. The pathophysiology of tremor. Muscle Nerve 2001;24:716-35. Raethjen J, Kopper F, Govindan RB, Volkmann J, Deuschl G. Two different pathogenetic mechanisms in psychogenic tremor. Neurology 2004;63:812-5.